In a lecture years ago, local planning legend Paddy Tillett revered Portland as a rather nice collection of fabric buildings. As one travels throughout the world, it is undoubtedly true that Portland lacks any really prominent buildings or any internationally recognizable icons in its skyline. It is then curious that Portland has developed such an international reputation as a city without the assistance of any real place-specific visual aides. In this way, Portland is more of a concept than a definitive setting. Does the city then need an iconic piece of architecture? Its own Sydney Opera House, Transamerica Pyramid, or Eiffel Tower? It does not appear so, as the city has been critically acclaimed for its success without one thus far. Part of Portland’s charm is its ambiguity, its modesty, and its priority towards the collectiveness. How do you then design for a place such as Portland? Is banality all that the city should strive for? Hardly, but it does make it difficult to find creative inspiration for each individual building project. There is no Portland vernacular, unless of course you count the Chinook Longhouse, but that tradition has long past. All of the city’s housing stock is imported colonialism (yes, even the preservationists favorite Bungalow originally came from Bengal, India), and Portland’s commercial real estate is a mishmash of mass-produced revival architecture and newer Modernism-isms, devoid of cultural identity by design. There are some local architects and architecture firms that have succeeded in crafting a contemporary Portland architecture over the years: John Yeon’s Watzek House, Pietro Belluschi’s Equitable Building, and Works Partnership’s bSIDE6 to name a few. Some would disagree, saying those examples could have been built anywhere, but when you look at the craft involved, the engineering feats, and the zoning code allowances for those designs respectively, it’s easier to understand why they are all Portland architecture. As the city ages, it is only a mere 150 years old after all, and as more and more place-specific architecture is built, Portland will develop its own ‘style’ that can be easily recognized, differentiating it from other places. Right now, however, that style is still being experimented on, both by architects and by non-architects alike. Portland’s concept is evolving, its ‘sense of place,’ its communal identity, and that identity takes physical form in its architecture; which then changes over the course of time. In this exciting time of cultural and architectural exploration we are seeing a plethora of different styles emerging. In the last major building boom, Portland saw its first major shift toward a culture of pedestrian-oriented moderate-density living and smaller, boutique office environments. That boom only hinted at a new architecture though, as it primarily focused on the urban form and human scale of things; generally disregarding the exploration of building types, relying primarily on nationwide standardized practices to protect the bottom line. The current construction trend appears to be more focused on the creativity of individual projects. Apparently, with the rise of the ‘creative culture’ comes with a genuine interest in the design of the built environment. This new economic driver pushes the artistic licence of individual architects, demanding more out of space-making, and the results have been impressive. Not to say that all of the new construction in Portland is great architecture, far from it, but the city is finally seeing some contextually respectful and artistically driven architecture being built in effectively prominent places. 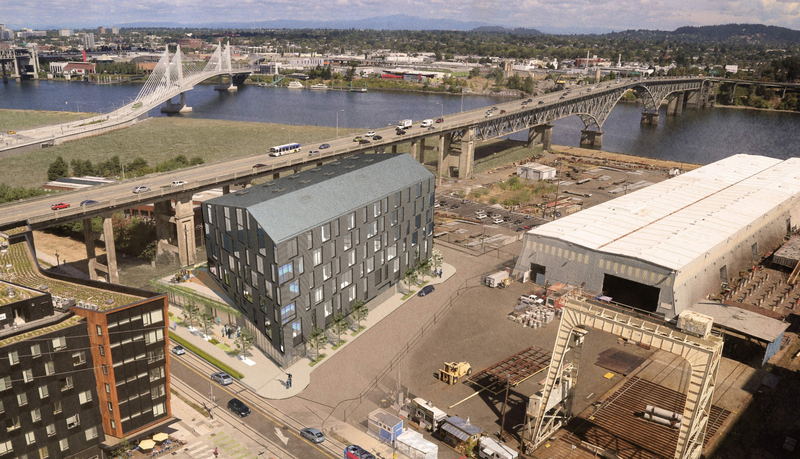 Recently LEVER Architecture and GBD Architects released their vision for Block 4 of the rapidly expanding Zidell Yards development around the base of the Ross Island Bridge. After LEVER’s success with smaller projects, like the indoor pedestrian mall Union Way, the young firm has taken on bigger and bigger commissions, quickly making a name for themselves. Just as The Emery gave the city a taste of what’s to come, its neighbor across the street, Block 4, does not disappoint in its urbanistic ambition. This development is also a great example of a strong contextual design process. As the development team described in their design narrative: “The building form can be understood as a concrete plinth that is an extension of the bridge, with an industrial shed sitting on top that [is] inspired by the barge building.”Having designed the new construction with direct correlations to its immediate surroundings, the concept begins to feel like part of the existing fabric. Not all contextual acknowledgements have to be based on historic elements, as the primary frontage mirrors the concave planes of The Emery, creating a welcoming gesture as a gateway to the fledgling neighborhood. The design team also noted that the unusual gabled-roof was important to the site as the building will be seen from both the bridge and the tram at a downward angle. Now, not every aspect of the design is wholeheartedly place-specific, as the offset window pattern of Block 4 has become the new norm for fenestration in Portland, a trend that can be traced back to mid-century Dutch architecture and can be found in various forms around the globe. There are other recent projects that highlight a different approach to contemporary Portland design, one being the new historic design process. This methodology is also based on context, but does not necessarily rely on direct observable connections. Instead, this process looks at traditional building forms and materials of the area and crafts them together in a contemporary way for contemporary spacial needs. Two good examples of this are the Mercy Corps Headquarters by the recently rebranded Hacker Architects and the Mithun designed Block 136 project that is currently under-construction on NW 13th Avenue. Both are located in or along historic districts, and as such, both had to abide by stricter development rules. For Mercy Corps and Block 136, the end game of historic preservation was not to directly mimic traditional design practices, as most of those practices are not only irrelevant to today’s culture, but often impossible to build with modern life safety regulations, construction practices, and available materials. Many of the older styles relied on forms of ornament that had meanings and symbolism associated with them that are either objectionable or have completely lost all relevance in contemporary society. In the end, contemporary building practices, spacial organization, and ornament are not as important when it comes to maintaining a historic district’s feel, rather it is the building’s scale and materiality which resonate more in a historic urban context. UNESCO’s own regulations regarding World Heritage Sites deplore historic mimicry, recognizing the need to differentiate old from new in order to respect and revere that which is historic, not blur the lines as Portland’s current Landmark Commission irresponsibly attempts to do with every project. I digress, Hacker’s response was to design a modern office building that has a similar window pattern tempo to that of its terra-cotta and cast-iron neighbors, and uses vertical terra-cotta tiles and metal spandrel panels as cladding. Mithun’s approach was to recreate the boxy, brick masonry warehouse form of the old railroad district, and reimagine it with exposed steel framing and industrial detailing. Both projects include offset, seemingly random yet logical, fenestration patterning, Block 136 more than Mercy Corps for historic continuity reasons. An exciting revelation in design code interpretation has lead to the return of heavy timber construction in Portland low and mid-rises. 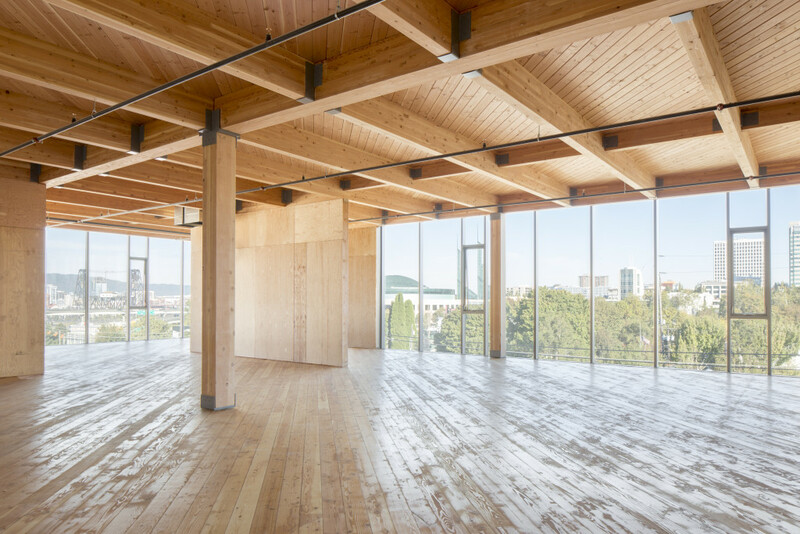 Being cost effective and aesthetically beautiful, these new buildings mix the local significance and natural demeanor of raw wood with contemporary elements such as floor-to-ceiling glazing and other modern amenities that are not found in the nearby century-old warehouses with similar ambience. 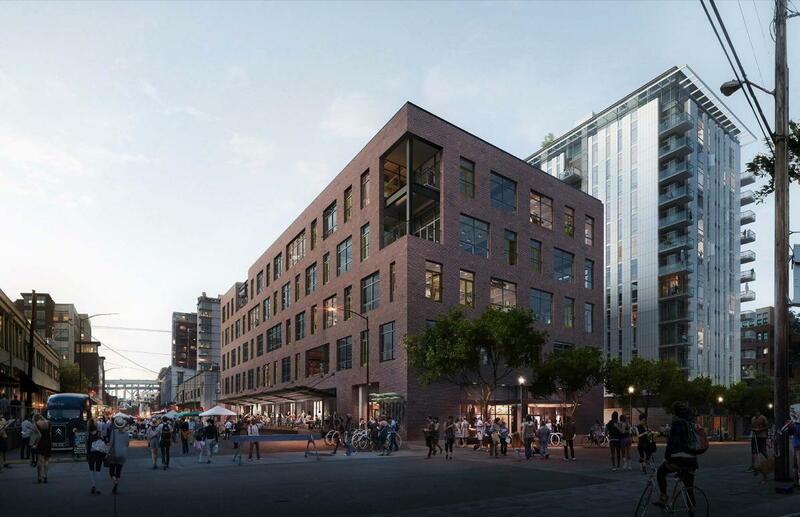 One of the most prolific local firms, Works Partnership, has recently embraced timber framing for their Framework Building, their under-construction 811 Stark Building, and a potential 19-story CLT mid-rise at the Burnside Bridgehead’s Phase 2 of Block 75. Much like the 4-over-1’s that dominate the local construction market, these new timber frame buildings take advantage of the first floor of concrete for life safety reasons, which adds another dimension to the style of these new typologies: heavy bases for the active pedestrian realm, street-visible exposed wood structure above, and high-contrast cladding to accentuate the wood interiors. Much of the design inspiration for these comes from the actual building programs themselves mixed with the desire to capture specific views and retail edges. Simplicity appears to be the primary goal, as the raw wood and exposed framing command a lot of textural attention on their own. Yes, these all also have offset fenestration. Yet another new design trend is the resurgence of Postmodernism. Perhaps its the 1970’s nostalgic nature of Portlanders or perhaps an homage to Michael Graves, regardless several new projects have recently emerged that use exaggerated anachronisms and somewhat cynical representations of form as design inspirations. One such project, The Woods from SolTerra, uses an abstract, pulled-apart traditional facade, supposedly inspired by a canyon, to mask the cheap materiality and disproportionment of their heavily-marketed environmentally-friendly yet high-maintenance and non-lasting design (more on commercialized greenwashing and real sustainability in a future post). 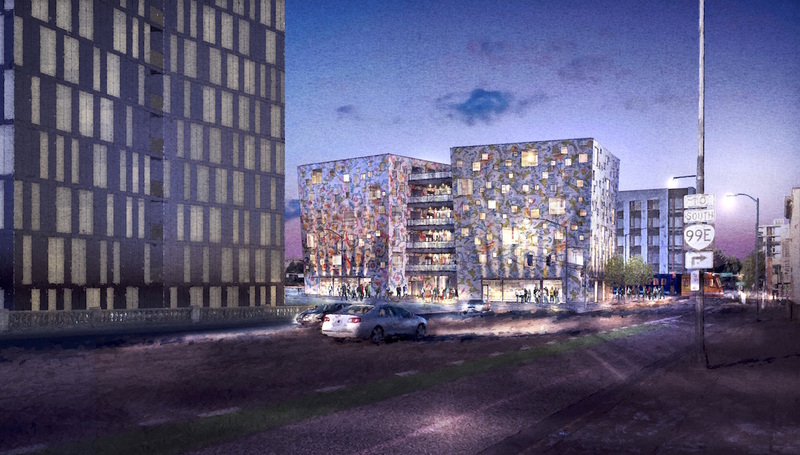 The most high-profile example of this new wave of Postmodern design is perhaps Kevin Cavenaugh’s latest project, the Fair-Haired Dumbbell, which is proposed as two tapering boxes that, before design review, wanted to be figuratively wallpapered in a traditional floral pattern. The Dumbbell also features seemingly random punched openings that further emphasize the abstract motif. Then there is the business-as-usual crowd, making buildings with no real Portland specific elements other than what code dictates. The newest large mixed-use proposal for Portland’s skyline, the 1455 SW Broadway Tower, is a good example of this. As currently proposed, the street level is inhumanly proportioned and unwelcoming, and the upper facade’s only major design element is an incredibly weak reference to the busy nature of Broadway. That big design element? Offset window patterning. Apparently the only conclusive design element in contemporary Portland architecture. As Portland evolves, its architecture will provide the lasting, physical memory of its changing tides. The city is young still, and its core values have yet to solidify, if they ever will. As American culture simultaneously becomes more individuality-driven and more rooted in memory, Portland will find its balance somewhere in between. Perhaps in a hundred years, for example, some architect will have to begrudgingly conform to offset fenestration in order to ‘fit’ into the historic fabric of the early 21st century, or the offset windows will become such a part of Portland’s identity that all new buildings will continue to have them from here on out. Only time will tell. I am a new visitor to your blog, and this post was eye opening and very interesting! Any thoughts on doing a compare/contrast of local vernaculars with Seattle? Thank goodness Block 136 is located just outside of the 13th Avenue Historic District, and was therefore reviewed by the Design Commission. The low rise brick building is a smarter and more successful response to the warehouses than would have ever got past the Landmarks Commission. 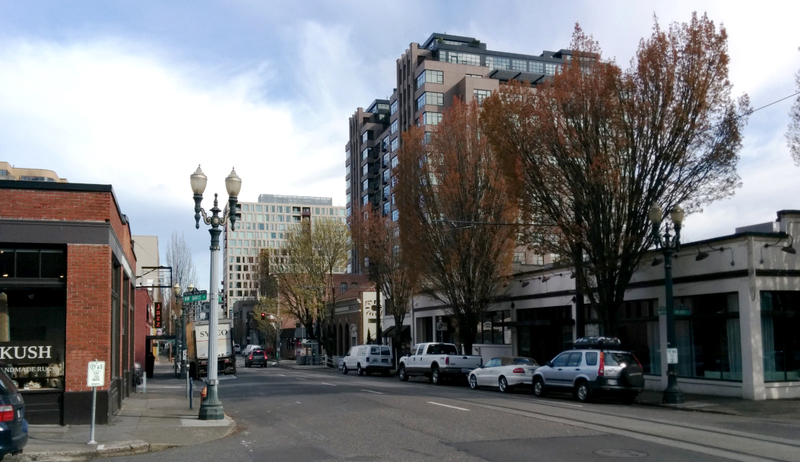 As a non-architect who grew up here and lives downtown, i’m summarizing your great insight about Portland’s current sense of place this way: Portland’s unambitious cityscape is moderately interesting yet distinctly portlandy.